Ideal for large field coverage, the Valley Rainger from Valmont will back and forth across the field utilising up to 98% along the way. The cart is equipped to take water from one of two different sources. It can either pull water from an open ditch or canal, or it can utilise water from a closed system or a pipeline. There are also options available to carry a variety of power units, pumps, generators and fuel tanks. The Raingers swing around option allows again for a wide range of field widths to be covered and can utilise either a ditch or hose as a water source. The swing around facility means that the span will rotate around the cart 180°. 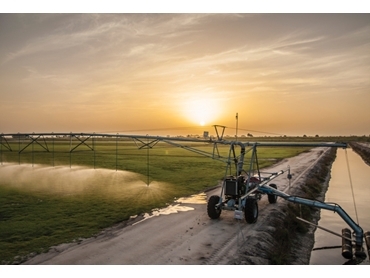 This function will allow one machine the possibility to more than double the amount of land that a standard linear will cover and will also maximise irrigated areas in irregularly shaped fields.